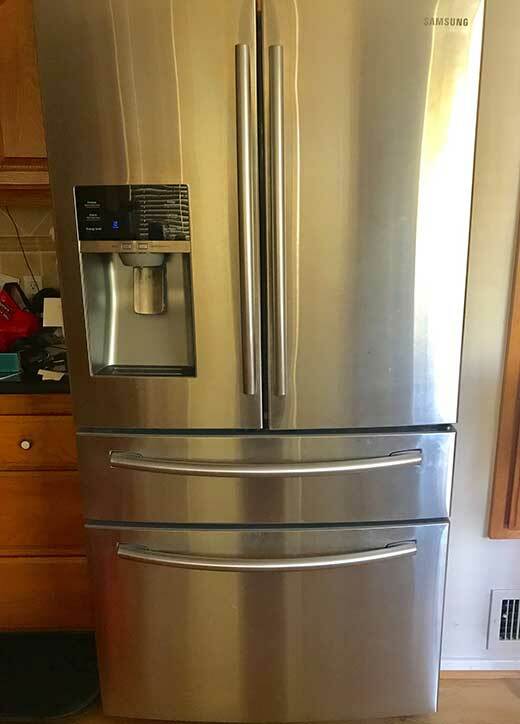 I have a Samsung RF28HMEDBSR french door refrigerator that’s only a few years old. 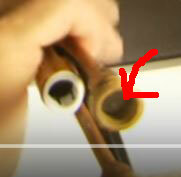 Several months ago, I started to notice a mild clicking sound coming from it occasionally. The sound would always stop as soon as I opened the door, and then usually restart a little while after closing the door. In the past few days, the noise got considerably louder. 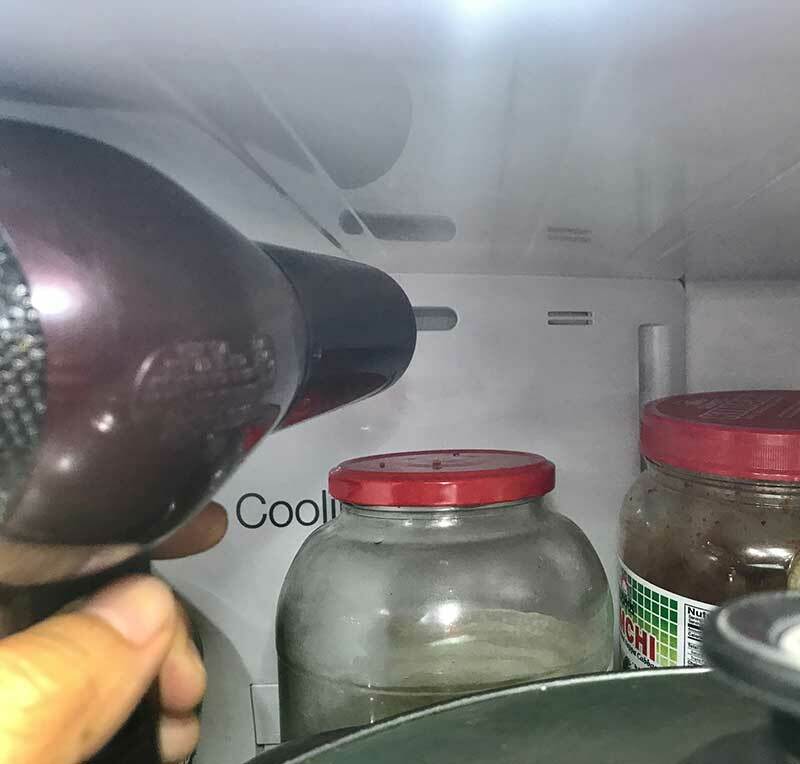 It became clear that the sound was coming from a fan that was inside the refrigerator compartment. 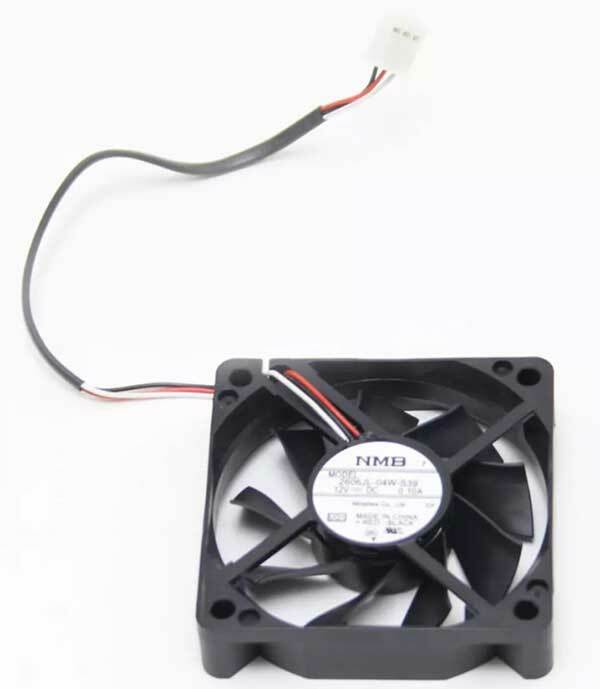 It started sounding like a fan whose blades were hitting something. Then this morning, it became unbearably loud.. like there was an airplane inside my kitchen! 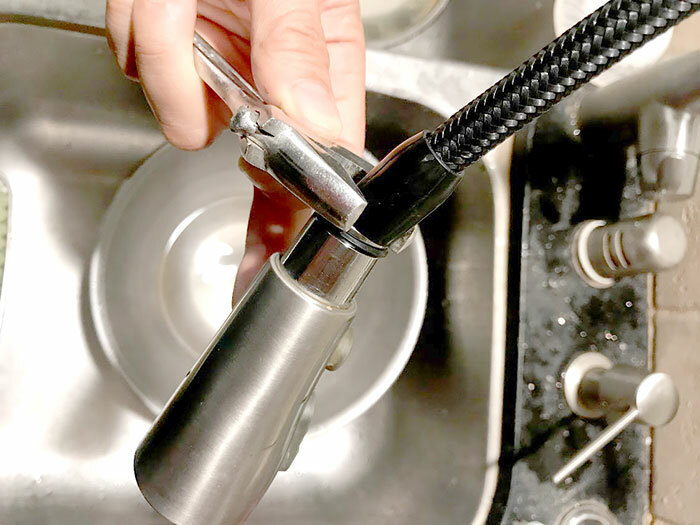 The proper fix is to remove everything from the refrigerator, take out all the drawers and shelves, remove the evaporator cover, and then melt the ice. I didn’t have time to do this today, and just wanted to silence the racket, so I decided to try a quick hack. 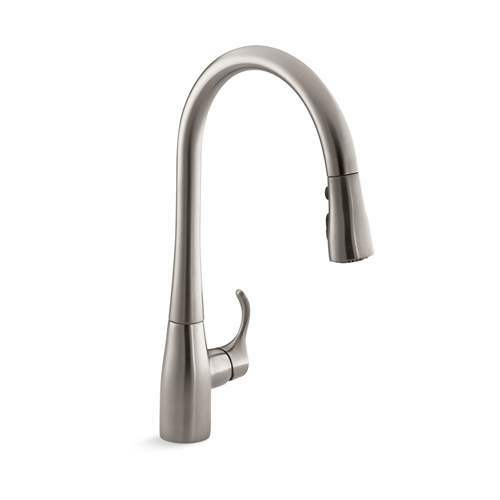 The ice build up usually occurs on the coolant pipes feeding the evaporator. 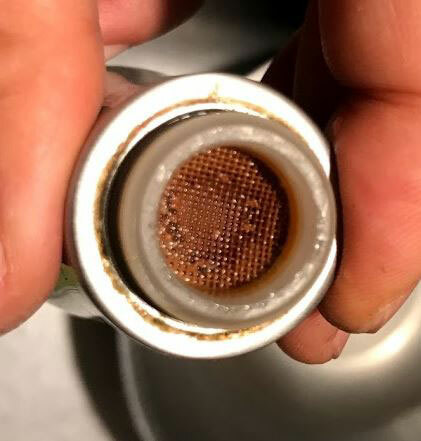 Notice how there are two large oblong air holes in the evaporator cover (see above photo), above Twin Cooling. 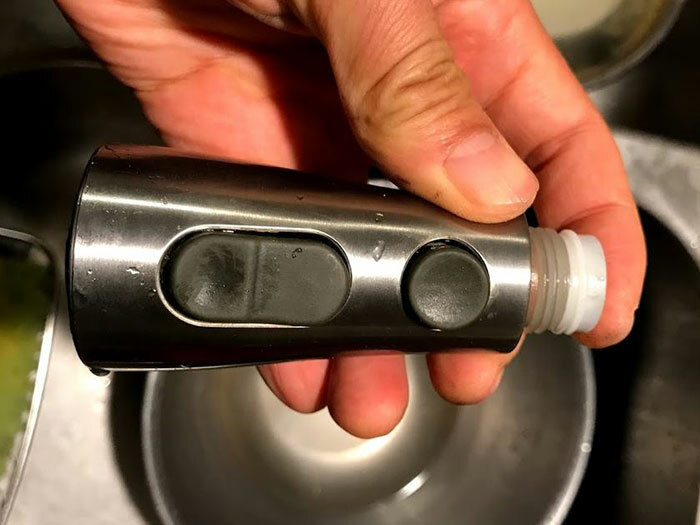 The coolant pipes are approximately behind the air slot on the right. Voila! The noise is completely gone! When I have more time, I will do the proper fix, taking the evaporator cover off, and melt the ice that’s covering the evaporator. 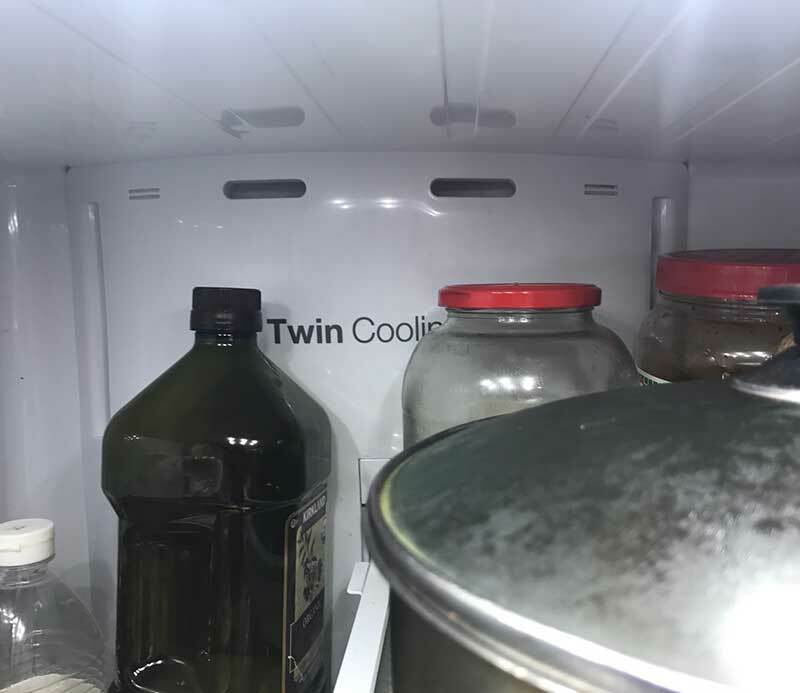 Most likely, there’s a lot of ice back there, which blocks air flow to the evaporator, reducing the efficiency of the refrigerator, which wastes electricity, and in the worst case, keeps it from cooling properly. I will make a post in the future, documenting the process as I go. At about 4:35 in the video above, the guy has a good hack for preventing the issue from ever happening again. 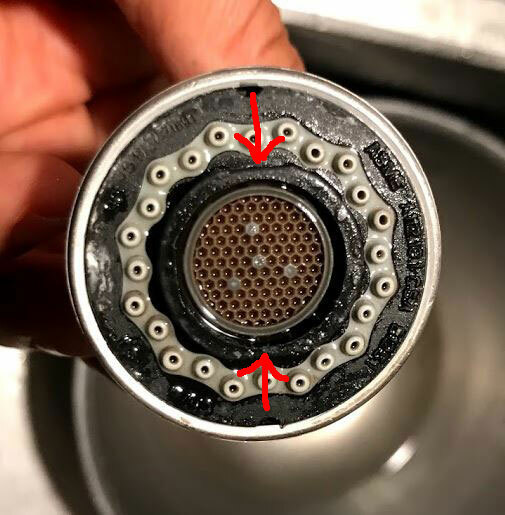 He moves the temperature sensor for defrosting from the inlet to the outlet pipe of the evaporator, which extends the defrost cycle. So which method is better? 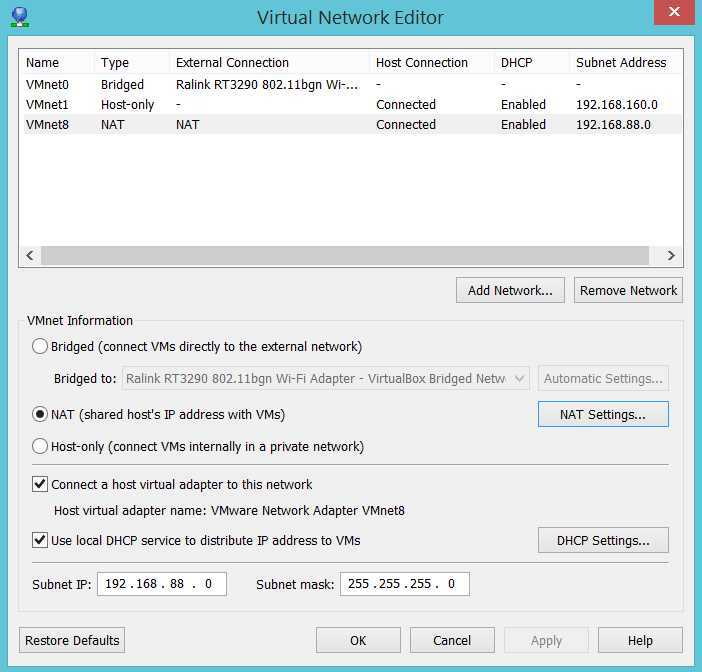 (1) is easier, because when you configure your VM’s network to bridged, the VM will get its own IP address on your LAN, and will be fully visible on your LAN, just like your real computers. 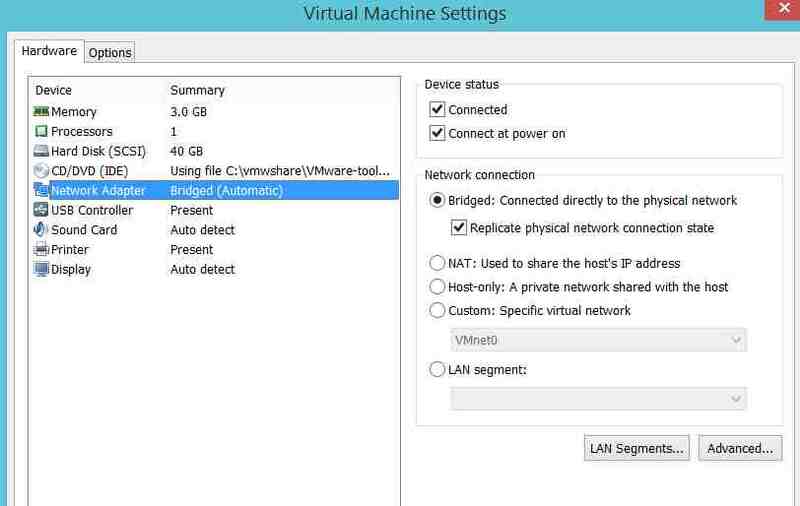 (2) is more secure, because you only expose the ports that you need to the LAN, so you don’t have to configure the firewall in the VM’s client OS. The output of ipconfig shows that on my LAN, my Windows host has IP number 192.168.1.115, and on VMware’s NAT, its IP number is 192.168.88.1. 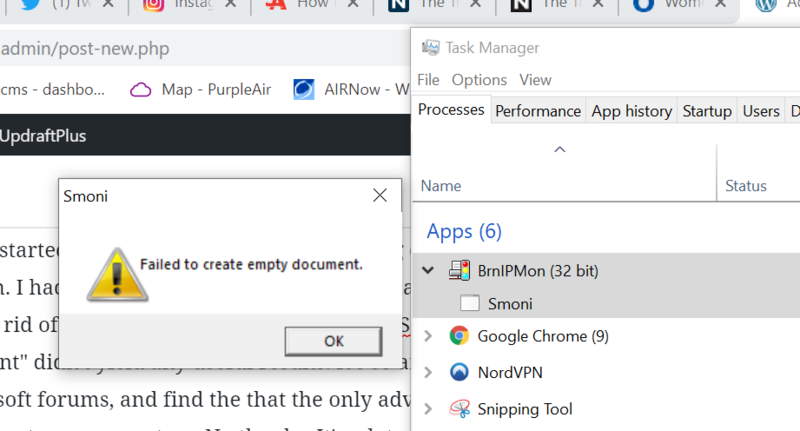 To test access to our apache server from within the Windows host, we an simply open a web browser, and point it to http://192.168.88.144:8080. Next, let’s configure things so that we can access the server from any host on our LAN. 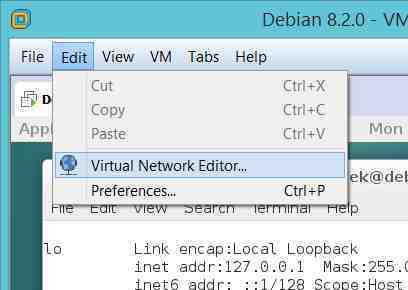 After you reboot your VM, it will obtain an IP number from your LAN. 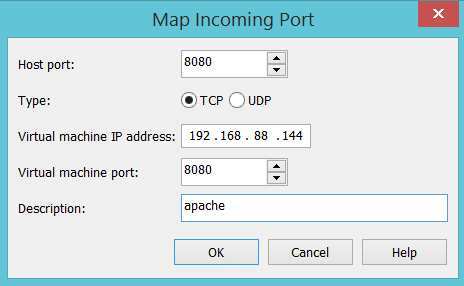 My VM came up with IP number 192.168.1.111, so apache is accessed via http://192.168.1.111:8080. Finally, click the OK button to save your port mapping. At this point, the port forward is functional, but most likely, your have a firewall running on your host computer. You must open up a hole in your firewall for the Host port you selected above. 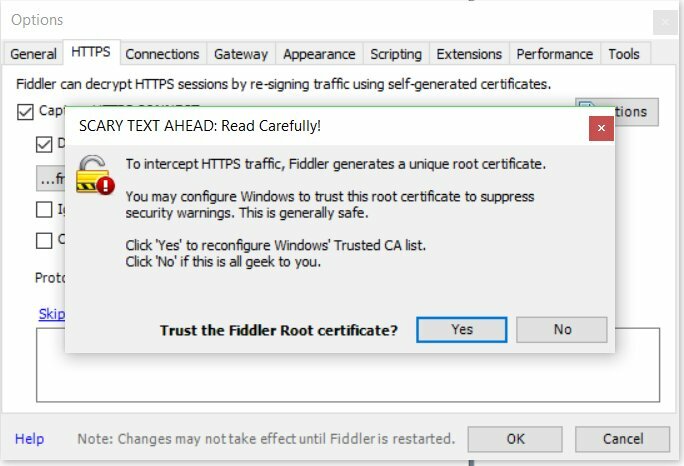 In the next dialog, select Allow the connection. Finally, you can decide where you want to rule to apply, Domain/Private/Public. Unless you’re planning to use the server while travelling, it is best to leave Public unchecked. Finally, you’ll be presented with a page to enter a name and description for the mapping. After you click the Finish button, you should be able to access your server from any host on your LAN. In our example, a web browser should work when pointed to http://192.168.115:8080. I’m working on an application where I need fine adjustment of PWM frequency. The existing PWM code that I found, such as the Arduino PWM Frequency Library, only allows integral frequencies to be selected. On pins supported by 16-bit timers, the Arduino PWM Frequency Library allows fine adjustment of duty cycle, but not frequency. 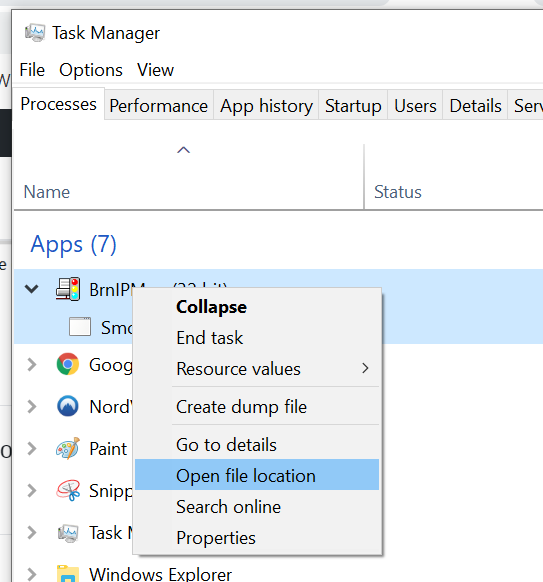 After searching for a while, I found an interesting article in Udo Klein’s Blinkenlight blog: Flexible Sweep. In the article, Klein has an Arduino sketch which sweeps the LEDs of a Blinkenlight board from 0-999.9999 Hz in increments of .0001 Hz. I hacked his sketch into PrecisionPWM, which outputs PWM to any arbitrary digital pin in increments of .0001 Hz. What’s nice is that since it doesn’t use the ATmega’s internal PWM generator, you can use it on any arbitrary digital pin, whether or not it supports hardware PWM. The speedup is even more dramatic with the USBtinyISP. In a specific test, I found that write/verify time dropped from 59 sec to 17 sec! You can also speed up programming from the Arduino GUI. Simply edit your programmers.txt file. 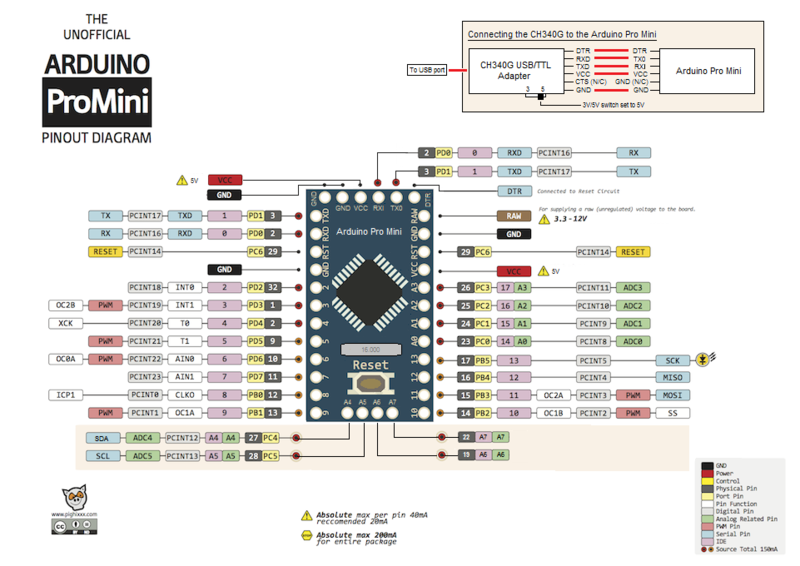 In older versions of Arduino, it can be found in <ArduinoFolder>/hardware/arduino/avr/boards.txt. For Arduino 1.8.x, it’s located in C:\Users\<YourUserName>\AppData\Local\Arduino15\packages\arduino\hardware\avr\<version>\programmers.txt. If the Arduino GUI is already running, you must restart it in order to load the new settings. 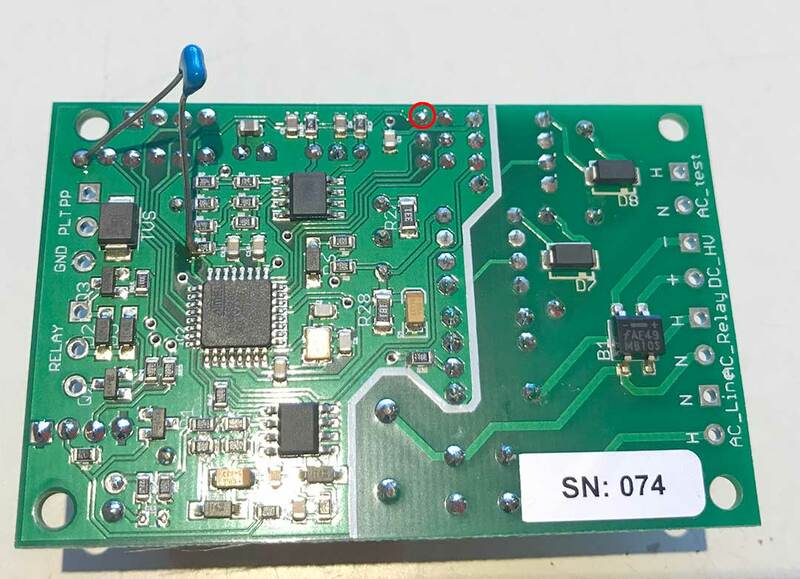 For wireless control of WS2812B (NeoPixel) LEDs, I initially played with Bluetooth SPP (Serial Port Profile), due to the simplicity of setting up the host software… from the host’s software’s point of view, the connection just looks like a physical serial port. Unfortunately, the flakiness of my Windows 8.1 PCs’ Bluetooth SPP support caused me to abandon that solution. 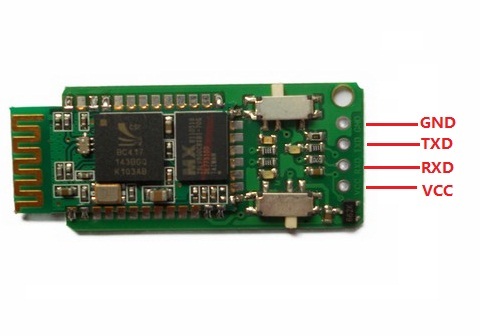 ESP8266 modules provide a very low cost method of interfacing WS2812Bs to WiFi. 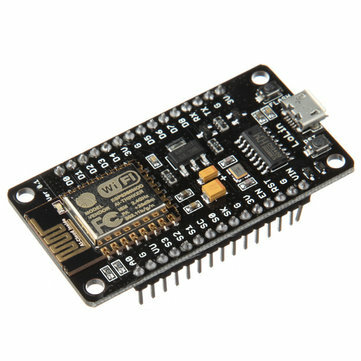 Adafruit’s Huzzah module costs $9.95, but on eBay, NodeMCU clones, such as the LoLin NodeMCU board can be had for ~$3 shipped from China. This makes it even cheaper than the Arduino/Bluetooth combination! What’s more, the LoLin board has a CH340G onboard, so it doesn’t require a FTDI cable to connect it to your host computer for programming. I ordered a few of the LoLin boards, but in the meantime, I started playing with the Adafruit Huzzah boards I had on hand. 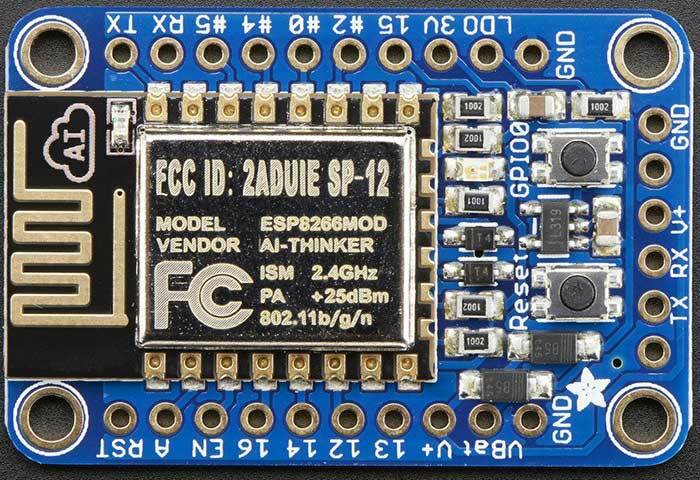 With the addition of ESP8266 support via the Board Manager, Arduino becomes an easy to use platform for code development. 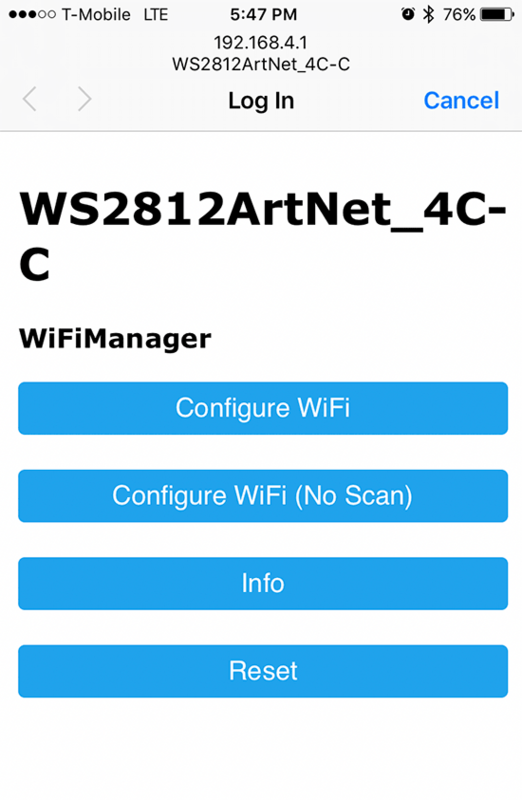 Also, there are easily obtainable libraries for both WiFi configuration and control of the WS2812Bs. One extra complexity of using an ESP8266 to control WS2812Bs is that the ESP8266 is a 3.3V device, while the WS2812B is a 5V device, (usually) necessitating level shifting. The WS2812B datasheet shows a threshold of >= 0.7VDD for logic HIGH, and <= 0.3VDD for logic LOW. The allowed VDD ranges from +3.5-5.3V. Interestingly, some WS2812Bs can actually work when powered by 3.3V, and driven by 3.3V logic, even though it’s out of spec, but many cannot. On the other hand, it’s totally within spec to be powered by 3.7V and driven by 3.3V logic. So, if you use a 3.7V LiPo battery to power the WS2812B strand, the WS2812B data line can be connected directly to the ESP8266 without any level shifting! If you choose to go this route, power the Huzzah from its VBat terminal, so that the 3.7V will be regulated down to 3.3V to power the ESP8266. 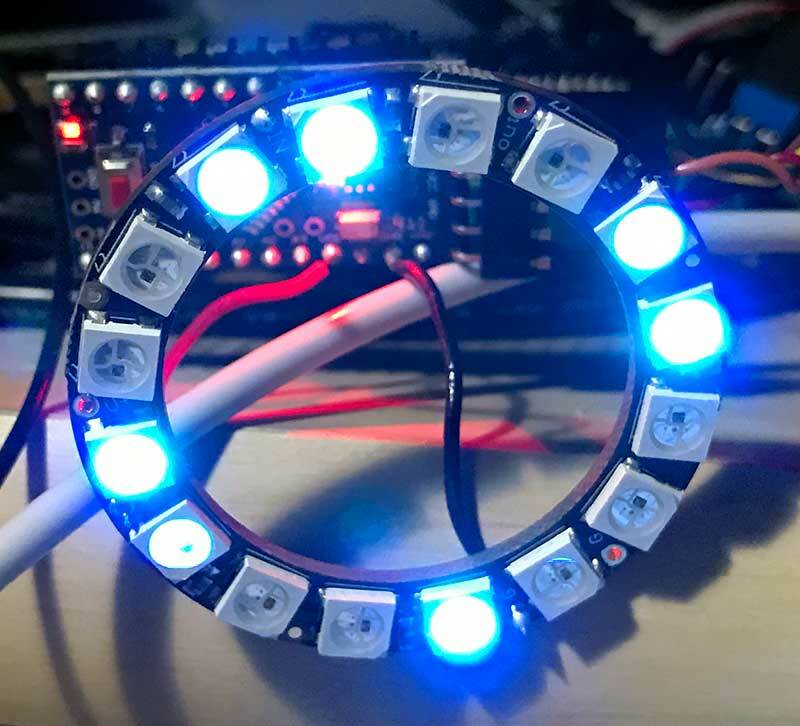 More details are available in Adafruit’s NeoPixel Uber Guide. The circuit is currently working flawlessly for me, driving my 5m long strand of 150 LEDs. In order to send data to our WS2812Bs over WiFi, we need some sort of IP protocol. 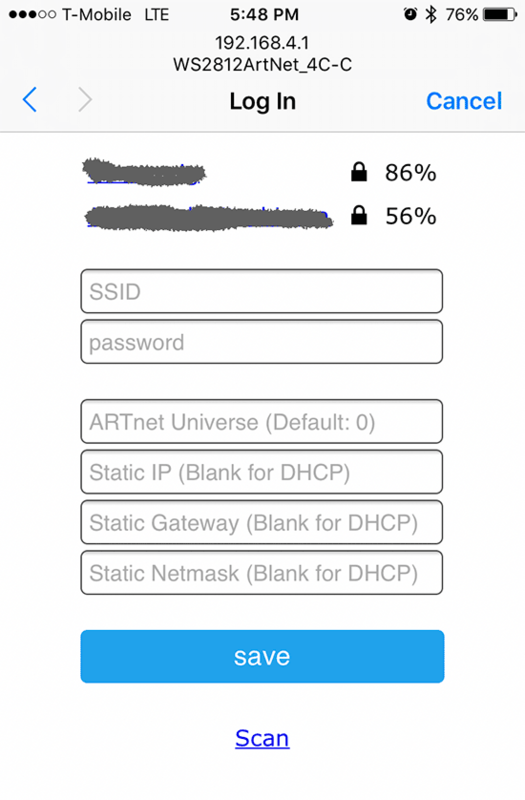 Art-Net is a royalty-free protocol, which sends DMX data embedded in UDP packets. I decided to go with Art-Net because it is an industry standard that is supported by a variety of Pro software, and Jinx! and Glediator can talk to it. I created a sketch, which is a mashup of a few different projects from github. The code is in my github repo: WS2812ArtNet. I stripped the Adafruit NeoPixel library down to the bare metal, and added a captive portal for configuring the WiFi connection. Also, it supports a hardware pin to erase the WiFi settings. 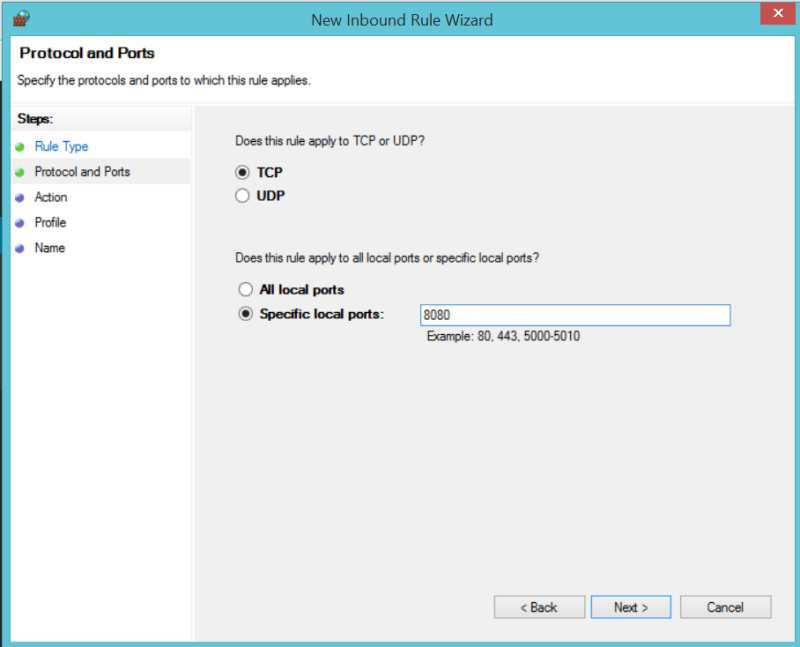 Configuration is done via a few defines in WS2812ArtNet.ino. 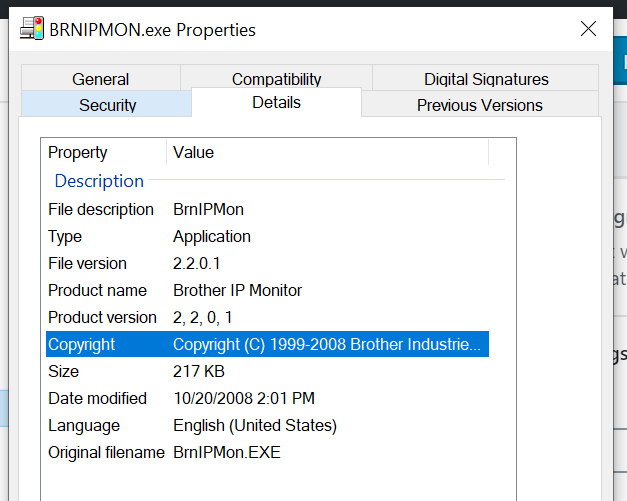 See the #defines for PIXEL_CNT, PIN_DATA, PIN_LED, and PIN_FACTORY_RESET. At a minimum, PIXEL_CNT must be set to the number of LEDs in your strand. PIN_DATA is used to select the pin that’s used to drive the data to the LED strand. PIN_LED is used to select the a pin which blinks an LED every time an Art-Net packet is received. This makes it easy to tell if the board is receiving data. 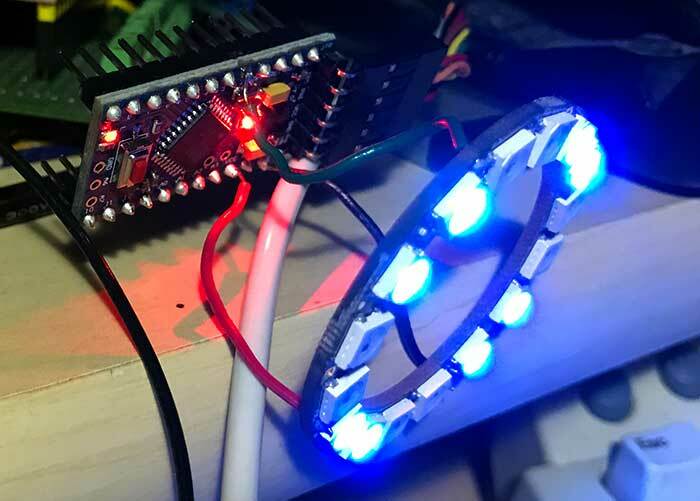 In addition, the LED is initially off at boot-up, and turns solid red when the ESP8266 connects successfully to a WiFi AP. By default, PIN_LED = 0, which makes it control the onboard red LED on the Huzzah. 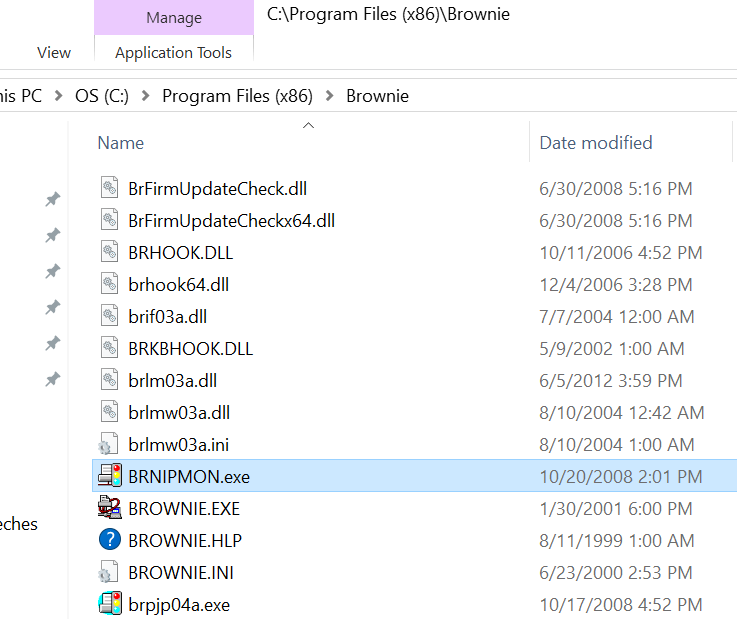 PIN_FACTORY_RESET wipes out any saved settings and clears the EEPROM when it’s grounded for 2 sec. Tap the desired AP’s SSID, and type in the passphrase. Additionally, you can also choose a starting Art-Net universe, and configure a static IP. After you tap save, the ESP8266 will reboot. 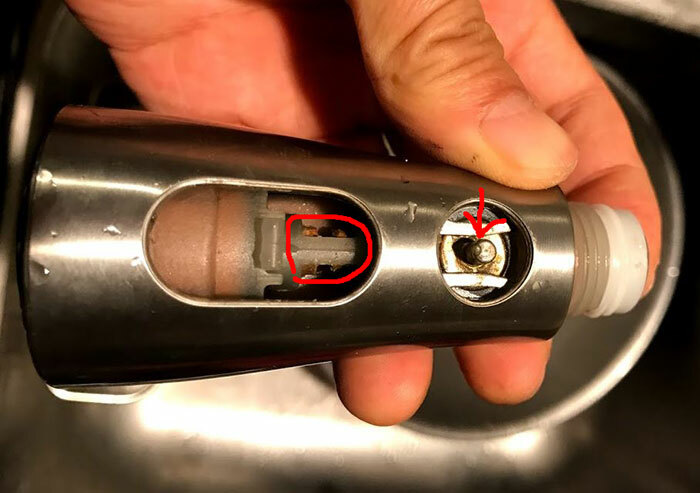 If it connects successfully to your AP, the onboard red LED will light. Then, the LED strand will go into the startup test sequence of lighting up red, green, and blue, and then turning off. Once Art-Net data is received, the LED still start blinking with every packet it receives. If you have trouble during setup, you can see debug messages by opening the ESP8266’s serial port in a terminal set to 115200,N,8,1. When configuring Jinx!/Glediator, select GRB as the pixel data format.